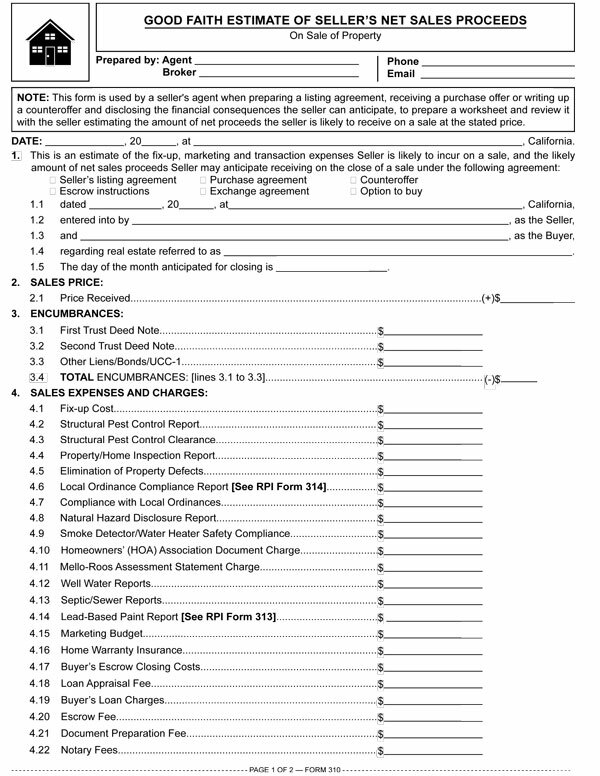 This form is used by a seller’s agent when preparing a listing agreement, receiving a purchase offer or writing up a counteroffer and disclosing the financial consequences the seller can anticipate, to prepare a worksheet and review it with the seller estimating the amount of net proceeds the seller is likely to receive on a sale at the stated price. The most pressing concern sellers of real estate have about the sale of their property is the amount of money they will receive on closing at the price offered by a buyer. Further, sellers know the net sales proceeds they receive on closing will not be the entirety of the price paid by the buyer for the property. Likewise, a buyer needs to bring together capital to purchase real estate. That is, they need access to cash to pay the price and associated costs of acquiring property. To document the cash a prospective buyer can gather from all their available sources to fund the purchase of a property, the buyer’s agent uses a worksheet, called a buyer’s cost sheet. Sellers often do not feel comfortable asking their agent how much money they can expect to receive when the sale closes. However, the serious nature of this unspoken concern is always present with a seller. The amount of money the seller will take away from the closing is of paramount concern. Sellers are primarily concerned with what they will actually receive as the net sales proceeds for transferring ownership. This amount equals the net worth of their property and what they receive on its sale. Most sellers do not know how to figure the dollar amount of net proceeds a sale of their property will bring. A seller initially thinks the net sales proceeds will be roughly equal to their equity in the property — price minus debt, less a broker fee. Most sellers are not familiar with the cost of retrofitting property and complying with governmental safety regulations, as well as escrow and title fees, lender payoff charges and a buyer’s demands for repairs — until these costs are brought to their attention by their agent. Further, the asking price is unadjusted for the need to fix up the property and clear it of structural pests and deferred maintenance to prepare it for marketing. On the other hand, sellers’ agents have a vast knowledge of the expenses which confront a seller when they market, sell and close escrow on a property. If the agent does not — or does not seek out available assistance, such as from their employing broker — they are patently negligent. For a seller’s agent, some degree of risk accompanies the delivery of disclosures, including net sales figures. The information may cause a prospective seller to get cold feet while soliciting a listing, or cause a seller to reject an offer and counter at a preconceived price needed by the seller but unacceptable to a buyer. However, these seller pricing decisions illustrate that the net sheet information is a material fact requiring an affirmative disclosurevoluntarily undertaken by the seller’s agent. The Good Faith Estimate of Seller’s Net Sales Proceeds form consists of four sections, each serving a unique purpose in setting the amount of net proceeds to be received by a seller on a sale. The following instructions are for the preparation and use of the Seller’s Net Sheet, RPI Form 310, with which a seller’s agent may prepare an estimate for an analysis of the costs the seller will likely incur in the preparation, marketing and sale of the property. The disclosure of this data to the seller is necessary for the seller to make an informed decision regarding whether to sell, and if so, on what terms and conditions. The instructions correspond to the provision in the form bearing the same number. Editor’s note — Enter figures throughout the net sheet in the blanks provided, unless the item is not intended to be included in the final estimate, in which case it is left blank. Check the appropriate box to indicate the underlying agreement which is the subject of this disclosure. Enter the name(s) of the parties to the underlying agreement, the identification date and place of preparation of the underlying agreement, the address or parcel number identifying the property for sale, and the day of the month on which escrow is to close for prorations and adjustments. 1.1-1.5: Identification: Enter the requested information to identify which transaction this good faith estimate of fix-up, marketing and transaction expenses relates to. 2.1. Price received: Enter the amount of the sales price to be paid by the buyer. 3.1. First trust deed note: Enter the dollar amount of the principal balance remaining due on any first trust deed loan of record as noted on loan payment records held by the seller, whether the loan is to be assumed or paid off on closing. 3.2 Second trust deed note: Enter the dollar amount of the principal balance remaining due on any second trust deed loan of record as noted on loan payment records held by the seller, whether the loan is to be assumed or paid off on closing. 3.3 Other liens/bonds/UCC-1: Enter the total dollar amount of the principal balance and any accrued unpaid interest on any judgment liens, tax liens and improvement district bond liens encumbering the property, and any UCC-1 liens on any personal property which are part of the sale, whether the liens will be assumed or paid off on closing. Editor’s note — Some purchase agreements, in their provisions for handling improvement district bond liens, omit any accounting on the transfer of title subject to a lien for the balance of an improvement district bond with annual installments. Annual installments on the improvement bond lien are treated in these purchase agreements as prorates of both the principal and interest installment amounts, without concern for an accounting of the principal balance which remains unpaid. 3.4 Total encumbrances: Add the figures entered in sections 3.1 through 3.3. Enter the total as the dollar amount of debts encumbering the property, whether assumed by the buyer or paid off on closing. 4.1 Fix-up cost: Enter the dollar amount estimated to cover the costs it is anticipated the seller will incur to ready the property for previews by other agents, caravans, walk-throughs by prospective buyers and open house viewings, such as the cost to add color to the landscaping, paint outside trim and any interior walls showing wear and tear, and replace any plumbing or electrical fixtures which are beyond repair or of unacceptable appearance. 4.2 Structural pest control report: Enter the dollar amount of the fee a pest control operator will charge to conduct a physical inspection and submit a report on his findings and provide an estimate of the costs of repairs necessary to eliminate any infestation and repair any existing damage or condition allowing for infestation. These are property conditions most buyers do not want to acquire. 4.3 Structural pest control clearance: Enter the dollar amount estimated to cover the cost it is anticipated the seller will incur for fumigation or to correct damage from an infestation or conditions supporting an infestation. The amount estimated will need to be reviewed and updated on receipt of the structural pest control report. Also, the amount estimated should be considered when setting any ceiling in a counteroffer on the costs the seller might be willing to incur to correct the adverse condition of his property. 4.4 Property/home inspection report: Enter the dollar amount of the fee a home inspection company will charge to conduct a physical inspection of the property and submit a report on their observations of defects existing on the property. 4.5 Elimination of property defects: Enter the dollar amount estimated to cover the cost it is anticipated the seller will incur to eliminate, by repair or replacement, any conditions not up to building or safety codes, such as malfunctioning or defective components, e.g., the roof, electrical wiring, plumbing, heating, the foundation, walls, fences, doors, and appliances. The amount estimated will need to be reviewed and updated on receipt of a property/home inspection report. Also, the amount estimated should be considered when setting any ceiling in an offer or counteroffer of the amount of costs the seller might be willing to incur to correct the condition of his property for transfer. 4.6 Local ordinance compliance report: Enter the dollar amount of the fee a local government agency charges to inspect the property and submit a report on its findings and the corrections required to be completed before transfer of ownership and occupancy may occur. 4.7 Compliance with local ordinances: Enter the dollar amount estimated to cover the cost it is anticipated the seller will incur for retrofitting, curative permits, and any repairs necessary to meet local ordinance standards as a requisite to a change in ownership or occupancy. The amount estimated will need to be reviewed and updated on receipt of the local agency’s compliance report. 4.8 Natural Hazard Disclosure report: Enter the dollar amount of the fee charged by a third party for a review of the county records and the preparation and submission of a report on the natural hazards the property is subjected to due to its location. 4.9 Smoke detector/water heater safety compliance: Enter the dollar amount of the cost it is anticipated the seller will incur to install smoke detectors and the water heater anchors or bracing which are necessary to comply with safety standards. 4.10 Owners’ association document charge: Enter the dollar amount of the fees charged by any owners’ association connected to the property for their delivery of a complete marketing packet of documents comprised of restrictions, operations, budgets, insurance and other documents mandated to be handed to the prospective buyer, and their delivery to escrow of their statement of condition of assessments. 4.11 Mello-Roos assessment statement charge: Enter the dollar amount of the fee charged for a statement of assessments to be provided by any improvement district which holds a lien on the property to secure the repayment of bonds issued by the improvement district. 4.12 Well water reports: Enter the dollar amount of the combined fees which will be charged by a licensed well-drilling contractor to test and certify the capacity of any well on the property, and by a licensed water testing lab to test and report on the quality of the water produced by the well. 4.13. Septic/sewer reports: Enter the dollar amount of the fee charged by a licensed plumbing contractor to test and certify the function of the sewage disposal system, and if it contains a septic tank, whether it is in need of pumping. 4.14 Lead-based paint report: Enter the dollar amount of the fee charged by an environmental testing company to investigate and report on the lead content of paint on the premises. 4.15 Marketing budget: Enter the dollar amount of any contribution (to be) made by the seller toward the expenses of marketing the property and locating prospective buyers. 4.16 Home warranty insurance: Enter the dollar amount of the premium the seller agrees to pay as charged by a home warranty insurance company to issue a policy to the buyer. 4.17 Buyer’s escrow closing costs: Enter the dollar amount of the combined escrow closing costs incurred by the buyer which the seller agrees to pay. 4.18 Loan appraisal fee: Enter the dollar amount of any loan appraisal fee the seller will agree to pay which will be charged to determine the property’s qualification for the purchase-assist loan which will be applied for by the buyer. 4.19 Buyer’s loan charges: Enter the dollar amount of any loan charges the seller will agree to pay which the buyer will incur for the purchase-assist loan needed to fund the price to be paid for the property. These loan charges are also referred to as non-recurring loan charges. 4.20 Escrow fee: Enter the dollar amount of the charge the seller will incur for escrow services to process the closing of the sale. 4.21 Document preparation fee: Enter the dollar amount of the charge the seller will incur, usually with escrow, for a third party to prepare the documents necessary for the seller to convey the property, such as grant deeds and bills of sale. 4.22 Notary fees: Enter the dollar amount of the charge the seller will incur for services provided by a notary to acknowledge the seller’s signature on documents which are to be recorded to accomplish the transfer of the property (grant deed, spousal quit claim deed, release of recorded instruments, power-of-attorney, etc.). 4.23 Recording fees/documentary transfer tax: Enter the dollar amount of the combined recording charges and transfer taxes collected by the county recorder and paid by the seller to convey title. 4.24 Title insurance premium: Enter the dollar amount of the premium the title insurance company will charge for issuance of a policy of title insurance conveying the seller’s conveyance of the property. 4.25 Beneficiary statement/demand: Enter the dollar amount of the combined fees the trust deed lender of record will charge for delivering a beneficiary statement or payoff demand to escrow which is needed to either confirm the loan balance on an assumption or subject-to transaction, or the amount of a payoff of the loan on closing a sale. 4.26 Prepayment penalty (first): Enter the dollar amount of any penalty the first trust deed lender will charge on a payoff of the loan on close of a sale. 4.27 Prepayment penalty (second): Enter the dollar amount of any penalty the second trust deed lender will charge on a payoff of the loan on close of a sale. 4.28 Reconveyance fees: Enter the dollar amount of reconveyance fees and recording fees the trustees on the trust deeds of record will charge to release the trust deed liens from the record title to the property sold. 4.29 Brokerage fees: Enter the dollar amount of the fees earned by the brokers which will be paid by the seller on the close of escrow for the sale of the property. 4.30 Transaction coordinator fee: Enter the dollar amount of the fee charged the brokers which the seller will pay for a third party to assist the listing agent in the preparation of the listing package and the sales package to provide all the documentation necessary to close the transaction. 4.31 Attorney/accountant fees: Enter the dollar amount estimated as the attorney fees and accounting fees the seller will incur as a result of their advice and assistance in the sale. 4.32 Miscellaneous expense: Enter the name of the further expense. Enter the dollar amount of the expense. 4.33 Miscellaneous expense: Enter the name of the further expense. Enter the dollar amount of the expense. 4.34 Total expenses and charges: Add the figures entered in sections 4.1 through 4.33. Enter the total as the dollar amount of the expenses and charges on the sale. 5. Estimated net equity: Subtract the figures entered in sections 3.4 and 4.34 from the figure entered at section 2. Enter the difference as the dollar amount of the estimated net equity, an amount against which prorates and adjustments are next made to calculate the estimated net sales proceeds generated by the sale. 6.1 Unpaid taxes/assessments: Enter the dollar amount of those real estate taxes and improvement district bond assessments which have accrued and have not been paid by the seller if they are to be prorated without a credit to the price for the remaining principal due on bonds under section 3.3. Taxes have not been paid for one of two reasons: they are not yet due to be paid to the tax collector or they are past due and delinquent. If they are not yet due, the taxes which accrued during the seller’s ownership will be paid by the buyer at a later date. Thus, taxes are prorated as a credit to the buyer through the last day prior to the date of closing. The proration is calculated as a daily amount of the annual tax based on a 30-day month. The current tax bill or, if it is not yet available, the past year’s amounts are used (and adjusted for up to 2% inflation, etc.) to arrive at the daily amount of the proration. Editor’s note — For example, if escrow is scheduled to close September 16, the tax billing has not yet been received and (if it has been) it has not been paid. Thus, 75 days of accrued taxes/assessments at the daily rate are credited to the buyer (and charged to the seller). 6.2 Interest accrued and unpaid: Enter the dollar amount of interest accrued and unpaid on loans assumed under sections 3.1 through 3.3 for the number of days during the month the seller will remain the owner prior to closing. The proration will be calculated as a daily amount of interest paid in monthly installments based on a 30-day month. The daily amount of interest accruing is credited to the assuming buyer for each day of the month prior to the day scheduled for closing since interest on loans is paid after the running of the monthly accrual period. Thus, the current installment will become the obligation of the buyer, unless the installment is disbursed by escrow and charged pro rata to each the seller and the buyer. 6.3 Unearned rental income: Enter the portion of the dollar amount of rent from the rent rolls, both prepaid and unpaid, which will remain unearned on the day scheduled for closing. The buyer is entitled to a credit of the unearned portion as a proration. The day of closing is the first day of ownership by the buyer and entitles the buyer to unearned rents for the entire day. The proration is calculated as a daily amount of the rent roll earned (accrued) based on a 30-day month. Editor’s note — For example, if the rents are $30,000 monthly, the daily proration for earned rents would be $1,000 and be multiplied by the number of days remaining in the month, beginning with and including the day of closing. If closing is on the 16th, the dollar amount of prorated rents credited to the buyer from funds accruing to the seller’s account on closing would be $15,000, the 16th being day one of the remainder of the 30-day month. For unpaid delinquent rents shown on the rent roll, see section 50 for an offset charge to the buyer by an adjustment. 6.4 Tenant security deposits: Enter the dollar amount of all the security deposits held by the seller (as landlord) which belong to the tenants as disclosed on the seller’s rent roll information sheet. This credit is an adjustment in funds, not a proration, which is due the seller on closing since the buyer on transfer of ownership will be the landlord (by assignment of the leases and rent agreements) and responsible for the eventual accounting to the tenants for any deposit held by the seller. Editor’s note — Include any interest accrued and unpaid on the security deposits from the date of the seller’s receipt of the deposits if mandated by rent control or landlord-tenant law. 6.5 Total prorates due buyer: Add the figures estimated in sections 6.1 through 7.6. Enterthe total as the dollar amount of all the “credits” the buyer can anticipate due to prorations and adjustments. 7.1 Prepaid taxes/assessments: Enter the dollar amount of real estate taxes and improvement assessments prepaid by the seller which have not yet accrued. Editor’s note — For example, the seller has paid all installments of taxes/assessments for the entire fiscal year (July through June). A closing of the buyer’s transaction on January 2 requires a proration charge to be paid by the buyer for one-half year’s taxes and assessments since they have been prepaid, but will not accrue until after the buyer closes escrow. 7.2 Impound account balances: Enter the dollar amount of any impounds held by the lender on loans assumed under sections 3.1, 3.2 or 3.3. The information is readily available as an “escrow account” item on the lender’s monthly statement of the loan’s condition received by the seller from the lender servicing the loan. 7.3 Prepaid association assessment: Enter the dollar amount of the prepaid and unaccrued portion of the seller’s current installment for any owners’ association assessment. The proration charge is based on a 30-day month for those days remaining in the month beginning with the day of closing as day one of the days remaining in the month. 7.4 Prepaid ground lease: Enter the dollar amount of the prepaid and unaccrued portion of rent the seller has paid on the ground lease if the property interest being purchased is a leasehold interest transferred by assignment, not a fee interest transferred by grant deed. 7.5 Unpaid rent assigned to buyer: Enter the portion of the dollar amount of delinquent unpaid rents to be charged to the buyer if the seller will not collect the rent before the close of escrow. These unpaid rents belong to the buyer on closing due to the seller’s assignment of the leases to the buyer, unless other arrangements are made for an accounting of the uncollected rents. Typically, a closing after the tenth of the month will not experience the need for a delinquent rent adjustment. 7.6 Miscellaneous prorates and adjustments: Enter the name of other items to be prorated or adjusted in the transaction. Enter the dollar amount charged to the buyer. 7.7 Total prorates due seller: Add the figures estimated in sections 7.1 through 7.6. Enter the total as the dollar amount of all the “charges” the buyer is likely to experience due to prorations and adjustments. 8. Estimated proceeds of sale: Subtract the figures in sections 7.7 and 6.5, and then add the figure in section 5 from the sum. Enter the difference as the total dollar amount of the estimated net proceeds generated by the sale. 8.1 Form of net sales proceeds: Enter the dollar amount of the net sales proceeds estimated in section 8 allocated to cash, carryback note, equity received in exchange or other form of consideration the seller will be receiving on the sale. Broker’s/Agent’s signature: Enter the date the seller’s net sheet is signed, the broker’s name and the agent’s name. Enter the broker’s (or agent’s) signature. Seller’s signature: Enter the date the seller signs and the seller’s name. Obtain the seller’s signature. Form navigation page published 12-2015.